The FDR D-EVO™ is the smart way to transition to digital. The FDR D-EVO™ is the smart way to transition to digital. 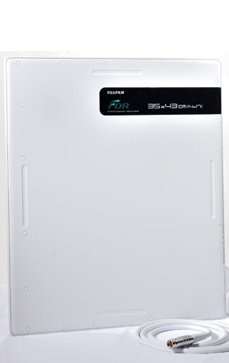 At 6 lbs, this 14 x 17" flat panel detector (FPD) is the lightest weight FPD in its category and its thin size presents an easy retrofit to existing analog rooms, making D-EVO ideal for all types of diagnostic environments. The D-EVO offers a fast and easy solution to any facility wanting to improve workflow and take advantage of what being digital has to offer. Just add the D-EVO to your existing Bucky and you are ready to go!